You must be a member of the Kiev Sightseeing Group to attend this activity. Would you like to join this group? 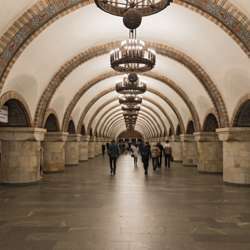 I invite you to see the most picturesque metro stations of Kyiv. Do you know which is the most beautiful? Do you know that the deepest metro station in the world is located in Kyiv? How many stations does Kyivan underground have? Why Kyivan underground has big and beautiful stations? Join our wonderful company for 2-2,5 hours to get the answers and enjoy the rest of the day! You will not be cold!